If you can't make the cruise, but would still like to do the movie, we will be eating dinner at Augustino's (awesome, family-owned deli right by where we are meeting on 64, just west of 59) at around 5:30 to 6:30 or so. Then we'll head over to the theater. Feel free to bring camping chairs etc to the theater, as many people like to actually sit outside their cars while they watch the movie. You are also allowed to bring in water/soda/snacks (no alcohol). The group might be interested in stopping at a pumpkin patch along the cruise (it is a FALL Cruise after all). What could be more fun than taking your MINI to a Drive-in Movie? How about a Drive-in Movie, a dinner, and a group drive in the Kane county area!! Details are still in the works, but here is the plan so far.. When:Saturday October 1st. Meetup for the drive at 2:00. Where:We will meet for a drive starting in the Menards parking lot near Route 59 and Route 64 in West Chicago. From there we will head out west for a nice drive. Dinner plans have not been set yet. The Cascade Drive-in is also located near Rt. 59 and Rt. 64. Come on out for the whole event, or just part!! Post below if you are interested in attending so we can get an approximate count. Here is the post that started things out on our Club Forum. Count me in, barring yet ANOTHER stupid family event. depending on the soccer schedule for the weekend, we'll try and make it. I'll be there, but I am going solo.. I'll roam with the gnome there… woo-hoo! We (Adrian & Greta) will love to attend. 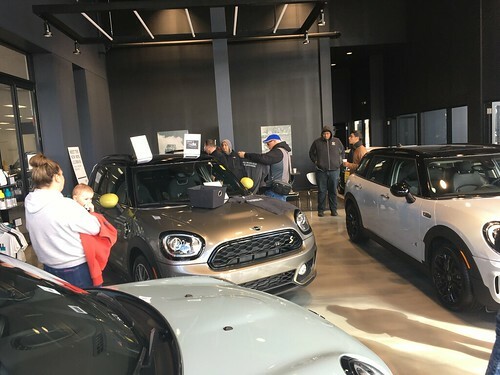 Can prospective MINI owners join in the fun? Right now we own an Austin Healey but we would love to check out all the MINI options before we buy. This event is open to anyone..It would be a blast to have an Austin Healey tagging along with us!! Both my wife and will attend!! I'll be there with one or two friends!! do we know whats gonna be playing that night? Hello! I was checking out your site becuase my daughter has a Mini Cooper. Could the Chicagoland PT Cruisers join in? We too were planning a trip to the drive in next Saturday! Just have to clean the MINI, but count me in! I finished the route last night, and I did my best to find a few roads that have some actual hills and wooded areas. But it's still northern Illinois, so you'll need to cut me a little slack. I wanted to give the group a few helpful details for Saturday. . . .
1. If you can't make the cruise, but would still like to do the movie, we will be eating dinner at Augistino's (awesome, family-owned deli right by where we are meeting on 64, just west of 59) at around 5:30 to 6:30 or so. Then we'll head over to the theater. 2. Feel free to bring camping chairs etc to the theater, as many people like to actually sit outside their cars while they watch the movie. You are also allowed to bring in water/soda/snacks (no alcohol). 3. I thought the group might be interested in stopping at a pumpkin patch along the cruise (it is a FALL Cruise afterall). 5. In case anyone gets lost or is running late to the meeting spot, my cell is 847-477-8039. Looking forward to seeing everyone Saturday at 2:00!